Now currently booking for 2018-2019 weddings! Congratulations on this most exciting time in your life! I'd be honored to be the one to photograph YOUR special day! You are in great hands with me! I have been photographing for many years. 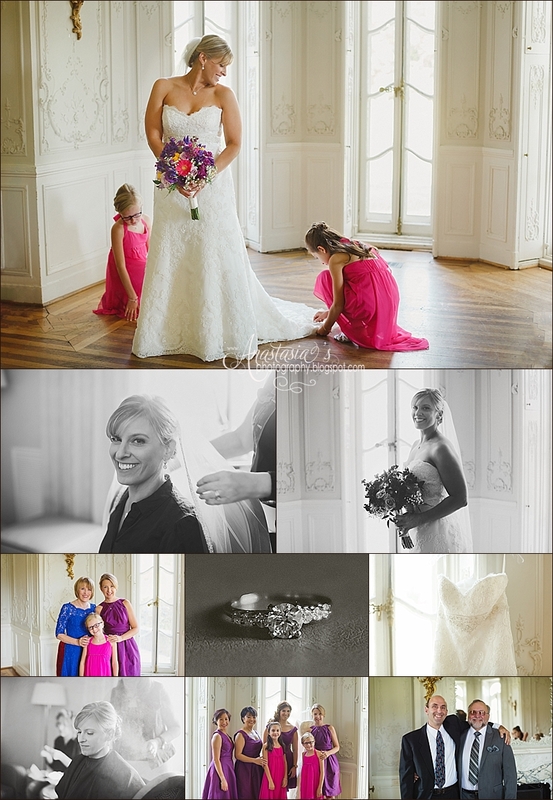 I enjoy working together with couples to create beautiful pictures of their wedding. I love capturing memories to help relive the day for many years to come. We can go over all the things that are most important to you because after all this is the day you have been dreaming about forever. Wedding packages for 4hrs. begin at $1500, contact me at StacyAEwell@gmail.com with your wedding date, wedding location and a time you'd like to meet up and we can go over your important details! I also offer engagement sessions (which is included in most wedding packages)! ~ If you are interested in having a special event photographed with a professional, one of a kind, creative photographic touch please email Stacy@anastasiasphoto.com or click here for further details. *Please note, all prices are subject to change without notice at any time. You secure your pricing/package details and date once your session booking fee is paid for. Travel charges may apply. I am now on Instagram, Facebook & Twitter! Instagram, Facebook & Twitter to see more latest custom photographs, posts, updates and more! 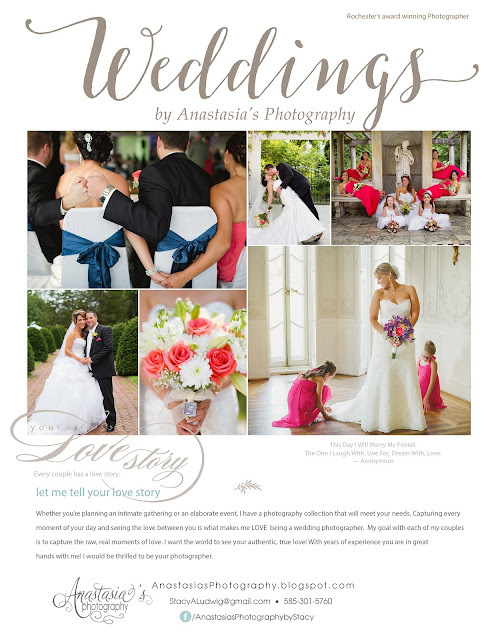 Anastasia's Photography by Anastasia (Stacy) Ludwig serving Monroe County Rochester and surrounding areas is located in Rochester NY (Penfield). Specializing in Newborn, Children, Seniors and Wedding Photography "on location" and "in studio"
Hi! I'm a mom of 2, they are the light of my life, a wife to an amazing guy and a custom premiere wedding and portrait photographer! Going through the paces of life, I have discovered an intense passion and great love for photography and a passion to create beautiful pictures for others! It's a wonderful creative art outlet for me. I enjoy capturing custom, one of a kind, whimsical, candid and unique pictures with lots of color and great moments! I am an on-location and studio family/life style, newborn, children, high school senior, wedding and events photographer for Rochester, NY, Monroe County, Finger Lakes and the surrounding areas! I look forward to getting the chance to photograph you and/or your family to cherish for many years to come! If you are interested in my custom photography, email me at stacyelwell@yahoo.com and let's see what beautiful images we can come up with! :) This blog is created to share with you both my recent adventures and personal life! Enjoy and thank you for taking the time to stop by and for your interest in Anastasia's (Ah-nice-to-see-ya)'s Photography. For photography services, please email me at StacyAElwell@gmail.com Looking forward to hearing from you! Serving the Rochester, NY and the surrounding areas (ie. Penfield, Webster, Pittsford, Victor, East Rochster, Fairport, Greece, Gates Chili, Spencerport, Finger Lakes etc. and any other areas such as Buffalo, Syracuse, Utica). Family/Lifestyle, natural light, custom one of a kind portraiture photographer; Families, Newborns, Maternity, Children, High School Senior portraits, Engagements, Weddings etc. Copying, saving, printing (unless specified), posting or reproduction, in any form, of any of Anastasia's Photography (Anastasia Stacy Elwell) photographs are prohibited and protected by Copyright laws. All offenders will be prosecuted to the full extent of the law accordingly. Anastasia's Photography owns (all files unless specified) and reserves the right to use any picture in any form such as, but not limited to the use in reproduction, advertising, and copyright.